My name is Allison, and I am from Perth, Western Australia. I made the decision to travel to Texas to see Dr Gemoules in February 2018. Let me tell you why it was the best decision I ever made. Here is a bit of my background story. It is a little long, but bear with me as I want to fully explain how much Dr Gemoules’ lenses have changed my life for the better. I was diagnosed with Keratoconus in my late twenties. I went from very decent vision to legally blind within a matter of months. The rapid progression was scary, but I dealt with it as best as I was able to. Firstly, I was fitted with RGP lenses. They improved my vision so that I could function, but were horrendous to wear. I felt like I had bits of glass or sand in my eye the whole time I was wearing them. They would also fall out of my eyes at the most inopportune times. I can’t tell you how many times I had to replace them, and they were not cheap. About nine years ago, I was fitted with intacs, (or kera-rings, as they are sometimes called). This was supposed to be followed by cross linking. They did not do these in Perth at the time, so I flew over to Sydney, Australia for the operation. My eyes were measured and the intacs were made to my specifications. Two for each eye to flatten the cornea. They did both eyes at the same time as I had flown from the other side of the country to get it done. Unfortunately, one of the intacs flicked out of the surgeon’s hand as he was about to insert it. So, they made do with the next best size they had on hand for my eye. Needless to say, the operation was not a success and we did not go ahead with the cross linking. I found out later that it shouldn’t have been done as my Keratoconus was very advanced. The likelihood of it working was pretty minimal. I soon found out that this is a bit of an ongoing theme here in Australia. The specialists did not explain anything properly and you just seem to be treated like a number. But that’s another story. I was then fitted with hybrid lenses. The comfort was a lot better than the original RGP’s and the vision was decent for a time. The vision deteriorated further and I was fit with hybrid lenses a couple more times to try and improve it. I was never told exactly what my visual acuity was, but when I looked at the Snellen Chart, I could only read the top line with my left eye, (with my hybrid lens). This would put it at about 20/200. I could just read the third line down with my right eye when wearing the hybrid lens, so that was probably somewhere around 20/70. Without the lenses, I could not read the eye chart at all. I have struggled with that kind of corrected vision for the last couple of years. It made work, driving and other day to day tasks pretty difficult, but I made do. I thought that was as good as it was going to get. I then started having all sorts of trouble with the eyes. I was getting Corneal Hypoxia regularly, which is basically a lack of oxygen to the eye. The pain was intense and I wasn’t able to wear my lenses. I was regularly confined to the house unable to wear my lenses. I missed work and many other things because of this. I was back and forth to the specialist trying to work out a solution. Their solution was that I needed to try Scleral lenses as they would not touch my cornea and should help improve my vision. I went for my first fitting a little over a year ago. I admit, I had my hopes up, thinking this was going to improve my vision. I was wrong. I went in for the appointment, got measured for the scleral lenses, then was sent home to wait for a week before they arrived. I got the call and went in to try my new scleral lenses. They had little black dots on them that I was told stay at the bottom of the eye. Okay, no problem. The right one went in and I was pleasantly surprised at the vision for a minute before I suddenly couldn’t see out of it. I couldn’t see out of the left one at all, no matter where the black dot was, (it was happily spinning around my eye like the right one). My hopes plummeted. I went back to the hybrid lenses for a time, before I tried again. Over the course of six weeks last year I was fitted four more times with scleral lenses in Australia. Every single time, they spun around in my eye. The right one had decent vision but only when the dot wasn’t moving. I could not see out of the left one and may as well not have been wearing a lens at all. At the last fitting, I said to the optician, “I can’t see out of the left eye at all, and the right one continues to spin around in my eye”. Her response? “I’m happy with that, take the lenses and we will see you in a couple of weeks”. Seriously?? I went in to see the other specialist before I left and told him the same thing. I said I wanted to take them out and use my hybrid lenses to drive home. So he said to go ahead. I couldn’t get them out. Because they were fitted so badly, they suctioned on to my eye. He said he didn’t want me wearing them home. He struggled and finally managed to get them out after digging his fingers into my eyes for a good few minutes. Then he said that unfortunately some people just can’t be fitted with scleral lenses and surgery was probably my only option. I knew my Keratoconus was advanced, but I also knew my corneas were still in pretty good shape considering. I didn’t agree that I needed cornea transplants, so I went home and did my research. This led me to Dr Gemoules in Texas. I read reviews and researched him online non stop. I emailed him with a few questions and he responded promptly and honestly. It was a big decision, but my husband and I decided to take the plunge. 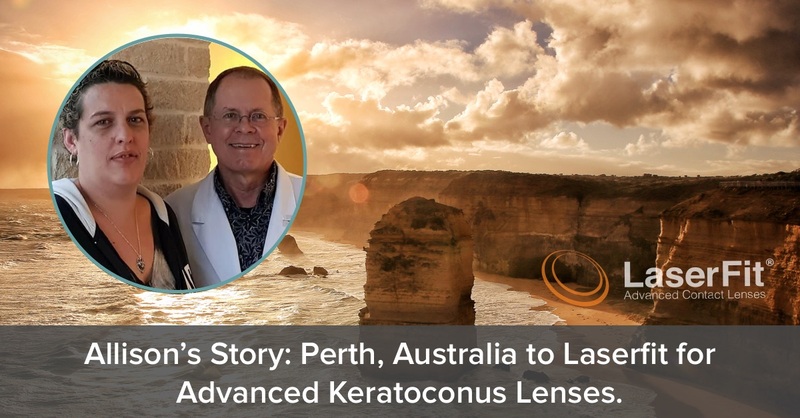 I was not going to get the help I needed in Australia, and we decided this was a much better option than cornea transplants. I allowed a faint flickering of hope, but not too much. I was getting used to the disappointment. I had to fly to the other side of the world without my lenses which was a bit daunting, but I was lucky enough to have my husband with me. I had my first appointment and then went back the following day for my first set of lenses. I didn’t get too excited. I saw the dots and in the back of my mind I thought, here we go again. No way in the world they are going to stay put and not move in my eyes. How wrong I was. Dr Gemoules got the fit right the very FIRST time! Pretty unbelievable on my notoriously difficult eyes. I was truly amazed, (and surreptitiously checking those dots non stop over the next few days). They didn’t move. Over the week, Dr Gemoules worked diligently on getting the vision better for me, (often making two lenses for the left eye trying to get it right). By the end of the week my right eye was at 20/30 and the left at 20/50. For me, that was worth the trip, but we decided to try further as we had another couple of days up our sleeve. I didn’t think he would be able to do any better with the left eye. I was wrong again. By the end of our time I had a pair of perfectly fitting scleral lenses and 20/30 in BOTH eyes! I am now seeing better than I have in a decade. I can read road signs and I can read things I could never see before. My knuckles are no longer white with gripping the steering wheel in my car. I actually enjoy driving again. I can sit here right now at my computer typing and reading what I write. I feel like a normal person again. I don’t have to pretend I see something anymore. I really can see it! I also had an amazing two-week road trip in the USA being able to actually see the sights. I am an amateur photographer and was so happy to pick my camera up again. To say Dr Gemoules changed my life is an understatement and I recommend him to anyone in need of scleral lenses. Your life will absolutely change for the better. Dr Gemoules truly cares and is determined to help his patients. Unfortunately, not every one in his profession has the same passion or ethics.